In his hard-hitting book Crush It! Gary Vaynerchuk describes passion as “the one thing that interests you most in the world.” It’s whatever fulfills and motivates you, Passion dominates your thinking, your work, your talk and even the way you relax. It’s doing what you love more than anything else. If you never find your passion, life can be boring and unfulfilling. 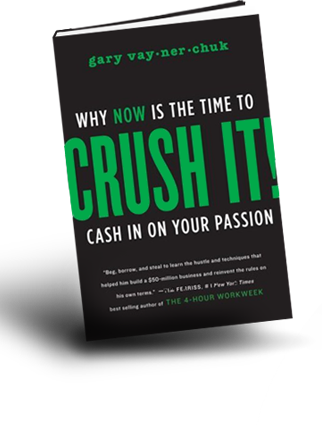 If you think you know your passion here is Vaynerchuk’s test for you to be “absolutely certain:” List at least fifty blog topics that you could write concerning the passion that invigorates you most. I have been thinking about Vaynerchuk’s book ever since I introduced it in an earlier newsletter (#380). The author stimulates readers to think about their own passions and, indirectly, what God has called each of us to do. For years I thought that my passion was people helping. In 1976 I even wrote a still-in-print book titled How to Be a People Helper. But Vaynerchuk’s book nudged me into thinking that while people helping is still of great interest, I’m more passionate about people building. I would guess that most readers of this newsletter are committed to people building as well. Isn’t that the essence of counseling, coaching, leadership, teaching, ministry and the other passions that most of us and many of our clients embrace? Recently I announced some changes in this newsletter. The format will change but the focus will continue to be on people building. To keep getting the newsletter in your inbox, you will need to resubscribe. If you have done this already there is no need to do it again. But if you have not done so you can resubscribe by entering your current email address in the upper right near the words: Email Subscription. If you forget to do this, the newsletter will stop coming to you after July 15. And before you leave, please take our 5 second survey below and consider leaving a comment letting us know what you do to be a people builder. Hi Gary, just want to say THANK YOU again for helping me think seriously about my passion back in 2007 through coaching sessions and your teaching in Tianjin, after I wrote down my vision and mission statement, I have been living a more-focused life and decision-making in many areas seems much easier than before. You definitely have been a very important builder in my life. Thanks so much Haiyan. Our coaching class in Tianjin ( plus the coaching sessions on the phone) was a very positive experience for me. I thoroughly enjoyed it. I am glad you learned from me and am glad that you are applying what you learned. But I learned a lot from you and your colleagues too. Please Greet Eric. I think it is time for me to come back to China to see all of you again. Gary – Your newsletters are always inspiring and thought-provoking. I especially love the book recommendations/reviews. Haven’t gotten to this one yet, but plan to soon. Thanks! When you speak of people building, I think of the process of discipleship as I see it in my experience. In my relationships I find myself encouraging people to discover who God has created them to be by exploring their passions. As I relate to people in this way, I find myself growing in awareness of my own passions and in my relationship with God. It is an interesting journey of mutual sharing and development. Dear Gary: You are “wise as a serpent and gentle as a dove.” Over and over again your articles inspire me and encourage me to grow myself as I endeavor to help others mature in Christlikeness as well. I have been teaching God’s word for over 40 years and still contuine to get excited each time I speak and share. Your articles are oft times a springboard for direction. God bless you, thank you and may HE bring you fulfillmentin in life. Barbara, you, Mary, Elsie, Haiyan and the others have very much encouraged me with your gracious posts. You are all encouragers and I am grateful for your posts. I have not read the book but one of my best friends has and he loved it. Finding my passion has made a great difference in my life and I discovered it while I was studying at Trinity with you Gary. I have been serving for over 20 years as a professor and a counselor and I feel as excited about it as if I had just started. Thank you for bringing to our attention this book and reminding me about the importance of discovering and practicing our passion. I have been reading about the “Motivational Gifts” and how they invigorate you to do what you have been called to do. Has anyone read or heard anything about that. Finding my motivational gift has been very helpful to understand my passion. Sergio, I was interested in your reference to motivational gifts. I have not heard that term before. Can you give us a couple of sentences to describe what you mean by motivational gifts? The idea intrigues me. It seems that the changes you made in your Nesletter made it more interesting and friendly. In my opinion a good way of people building is to apply the simple rules of life, listening to people, being an example and creating a positive impact in people´s life. It is important to know the environment you are living at. The primary needs of people in a poor nation may be food at first, while in a developed country where people are stressed by economic issues and long hours at the office. But I think the most important is to create a positive impact where we are and around us, beginning in our family. Thanks Ezequiel. Yesterday we had eight comments to this week’s newsletter. Of these four were from Latin America, one from China. I appreciate all of these as well as the others. Your comments from São Paulo (where you and I spent time together) apply around the world. Most of my people-building involves interaction with the people I teach, mentor, and talk to in stores, restaurants or at the fitness club. Coaches and counselors are specialists in people building but we all can be people builders easily,by being sensitive to the people (including strangers) that God brings into our lives. I have recently, as I was trying to write an elevator speech, decided what I have really become is a “personal trainer” for women’s minds. Helping them to see that they can have the “mind of Christ” and how they can get stronger everyday.